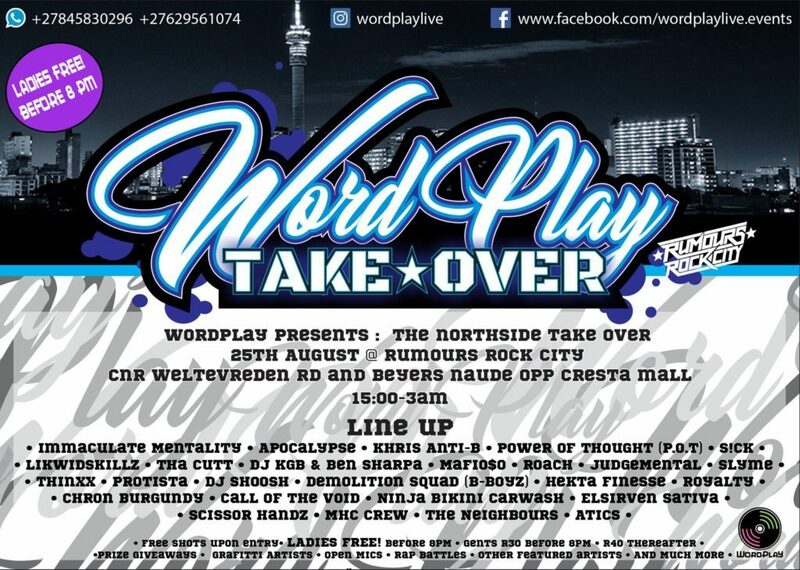 Wordplay Live’s event The Northside Takeover is going down in big way this weekend with one of the most epic hiphop culture line-up’s of the year!! Most of our favourite Johannesburg local acts will be doing their thing and bringing the house down so we suggest you head on down to Rumors from 3pm to ensure you don’t miss a thing… Catch ThiNXx alongside Power Of Thought, Kriss Anti-B Creative-prenuer, Chron Burgundy, Likwidskillz, Protista, SLYME, Tha Cutt, Elsirven Sativa, Judge Mental, Atics, Immaculate Mentality, Call of the Void, Dj Sizzor Handz, Demolition Squad Bboys, Apocalypse, S!ck, Hekta Finesse, Ninja Bikini Carwa$h and loads more!!! ? There’s gonna be everything from beat boxers to graffiti artists to tattoo artists… there’s gonna be battles going on… open mic sessions… producers showcasing their stuff…you name it… they got it going down! If you’d like to get involved, this is how: ?